ABC Children’s continues to showcase incredible Australian programs that reflect the world of the preschool audience by welcoming Bluey, a loveable and inexhaustible six-year-old Australian Blue Heeler dog, who makes her debut on ABC KIDS at 8am on Monday, 1st October. During this 52 x 7 minute animated series we follow Bluey, who loves to turn everyday family life into boundless, playful adventures, developing her imagination as well as her mental, physical and emotional resilience. These adventures unfold in unpredictable and hilarious ways, bringing her dad, Bandit, mum, Chilli, four-year-old little sister, Bingo, and the whole neighborhood into her world of fun. Bluey is a celebration of the role of imaginative play in shaping healthy children. Unstructured, self-directed play allows Bluey to create and explore her world autonomously, conquering her fears while practicing adult roles, sometimes with her sister Bingo or with other pups, and always with her parents to guide her. Bluey’s Dad, Bandit, is an Archaeologist (who loves to dig for bones) and is voiced by award-winning musician and song writer, Dave McCormack (frontman of rock band Custard). 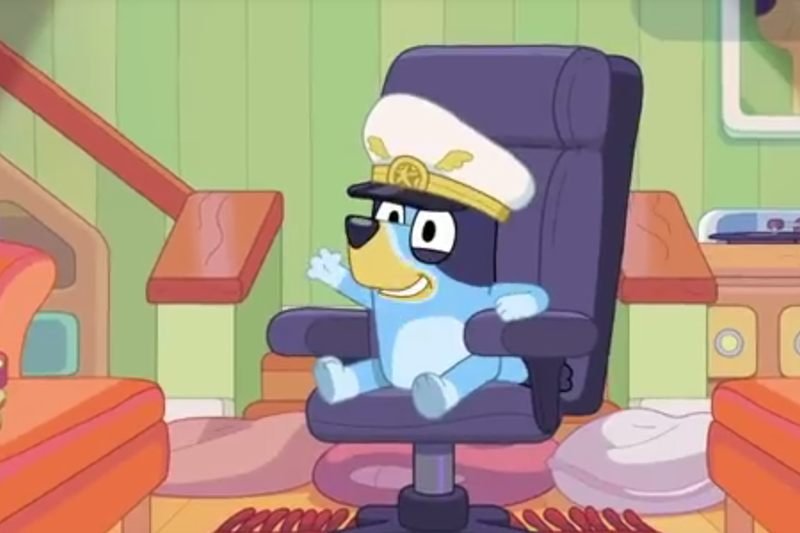 Bluey’s Mum, Chilli (who works part-time in airport security), is voiced by actress Melanie Zanetti (Tidelands, The Bureau of Magical Things, The Family Law). Bluey, Bingo and some of their friends are voiced by children of the production crew, making this series truly a family affair, on and off the screen. The Queensland based creative team behind this authentically Aussie series includes creator/showrunner Joe Brumm (Dan The Man, Charlie and Lola), Emmy awarding-winning producer/executive producer Charlie Aspinwall (Doodles, #7DaysLater), Emmy awarding-winning executive producer Daley Pearson (#7DaysLater, The Strange Calls), and animation director Richard Jeffery (Tinga Tales). The series was executive produced by Michael Carrington, ABC Acting Head of Content Distribution, and Henrietta Hurford-Jones, Director of Children’s Content for BBC Studios. Bluey is a Ludo Studio production for the Australian Broadcasting Corporation. Principal production investment from BBC Studios, Australian Broadcasting Corporation and Screen Australia. Developed and produced with the assistance of Screen Queensland. For a first look at this gorgeous, new authored series click here. Bluey screens daily at 8am on ABC KIDS and ABC KIDS iview from Monday October 1.